In Honey in the River, you will meet the African gods and goddesses including Yemoja/Olokun, the orisha of the sea. Click here for readers' comments. Marsha Scarbrough is an American journalist who traveled with Buddhist teacher Joan Halifax, danced with movement guru Gabrielle Roth, earned a brown belt in karate from martial arts legend Tak Kubota, participated in Native American healing ceremonies with Beautiful Painted Arrow/Joseph Rael and produced workshops for a Nigerian master drummer. Marsha is the author of the award-winning memoirs Medicine Dance and Honey in the River. She lives in Madrid, Spain, and offers shamanic workshops, including Drum Journey to find your Power Animal, throughout Europe. 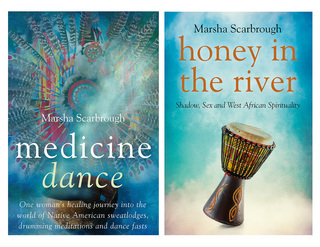 Early in her book, Medicine Dance, Marsha Scarbrough says, "Native American tradition requires that healers somehow bridge two worlds." After reading the book, it is clear that Scarbrough is something of a bridge herself. Her writing, to use one of her words, "concretized" rituals, meditative states and inner transformation--bridging spiritual and mental awareness. Her pared-down writing style feels like years of work crystallized into this solid nugget of a book.